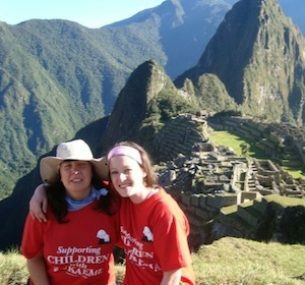 Four and a half years after being diagnosed with leukaemia, Yvonne completed the 2009 Peru trek to Machu Picchu, raising over £1,600. Having never travelled outside of Europe, or even been near a tent, this was definitely going to be a challenge of a lifetime! Three planes later, we arrive in the beautiful city of Cusco, Peru. Free day to acclimatise to the 3,200m above sea level. Am happy to say am dealing quite well with altitude and hope it’s down to the months of training – though my training regime wasn’t exactly tough! Went to Pisac for a warm-up trek over part of the Inca Trail. Beautiful weather and the walk was very useful in giving us an idea of what to expect when we began the proper trek to Machu Picchu. Set off from Cusco at 6.30am. Now starts our real adventure! We all register at the start of the trail. Everyone in good spirits and very excited – finally we were embarking on the journey we had looked forward to for so long. Trek not too tough or long. Weather dry and warm. Spectacular scenery. Reach camp late afternoon. Delighted to see our tents have been put up – can now relax for the evening. Delicious meal, then to bed. Looking forward to day two – the hardest day! Wake up to sounds of roosters, dogs barking and cows mooing – quite an experience. Had decent night’s sleep – very impressed with myself coping extremely well in such alien conditions, and looking forward to day ahead. Have been told that day two is the toughest – Dead Woman’s Pass! Doesn’t sound appealing. We are assured name is only due to the rock formation looking like a woman lying down. Pass is at 4,200m above sea level – highest point of the trek. Start is fine – quite steep climb but walking through pretty forest. Stop for lunch then begin last stretch before reaching Dead Woman’s Pass. Path uneven, steps all shapes and sizes. Starts to rain. Every so often I look up to summit and see small figures; the fit ones who had reached the top already! Gradually gets harder as air thinner, but keep reminding myself have been through experiences a lot harder to conquer – I will reach the top of that mountain! …but such large steps! Really have to push myself that little bit more to get to the top. I was standing on top of a mountain in South America, in the clouds at 4,200m and it was snowing. I just couldn’t get over it – I was simply amazed! Can’t describe exactly what I feel when reach the top. Don’t know whether to laugh or cry. Was such a hard task but I feel so elated – can only smile and feel just a teeny bit proud of myself! Begins to snow. Am standing on top of a mountain in South America, in the clouds at 4,200m and it’s snowing. Can’t get over it, am so amazed! Take a few photos then begin descent. Can see campsite down below – doesn’t look too far. Worst behind us, now it will be plain sailing. Or not. Steps and more steps; down and down again and camp not getting any closer! To our joy snow and rain stops – gets sunnier and much warmer. Indescribable scenery. Delicious dinner, then to bed! Told would be a hard day because the longest and starting at altitude. Start climbing as soon as we set off. Not as hard as yesterday but still difficult, particularly because haven’t slept well. Path becomes more even once at top of the pass but consists of an unearthly amount of steps! All different shapes and sizes and descend many of them on my bottom! Some quite steep and I fear falling – so take them as would a small child. Seems like most sensible way! Long day but once we reach the camp, that’s it and it’s Machu Picchu tomorrow! Great buzz in camp. Everyone has arrived safely, group still complete and we are all going to reach our ultimate goal in a matter of hours. Despite all the excitement – sleep very well! It has arrived – the day we have all been longing for – we are going to watch the sunrise over Machu Picchu! 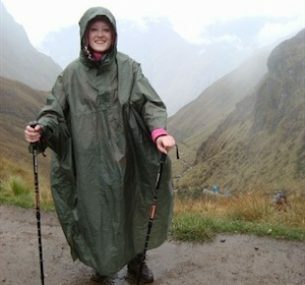 For over a year I have looked at that image on my computer screen and at the Trek the Inca Trail information I regularly send out to our potential fundraisers – and now here I am, on my way to see it in person. As with Dead Woman’s Pass, not sure whether to laugh or cry. Walk to the sun gate seems to go on forever. Left camp at 4.30am, in the dark. Day gradually getting brighter and we all rush to get there before the sunrise which we are told is around 7am! By 6.50am have climbed (more stairs) to the sun gate. In front of us, there it is, Machu Picchu! Surreal feeling. Like a dream, looking directly at it, watching the sun slowly creep over the mountains and begin to illuminate the ancient Inca ruins. Pictures I take look as if I have placed myself in an image of the site. It is truly amazing. So much more than what I had imagined. As this lost city of the Incas becomes lit up by glorious sunshine, I contact family to let them know I have done it. I have achieved what I set out to do and I cry tears of joy and sadness that my friends and family, who helped me get to where I am standing, are not here to be part of this special experience. Looking out over Machu Picchu, I am reminded how lucky I am to be here. 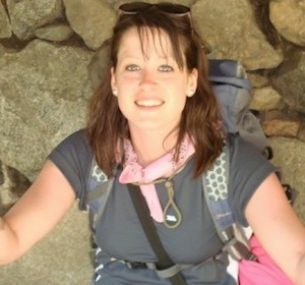 If treatment and research into leukaemia had not come as far as it has, I may not have been here to undertake this adventure of a lifetime. If treatment and research into leukaemia had not come as far as it has, I may not have been here to undertake this adventure of a lifetime. Feel privileged to be here. This is something I think everyone should do. It is hard but so worth it. A challenge is not a challenge without obstacles to overcome, and the feeling of achievement is indescribable. My words and pictures do not do this challenge any justice – the whole journey must be seen to be believed, as clichéd as that sounds!